Sea Beaumont has pulled together a most comprehensive collection of resources at Caledon Downs. 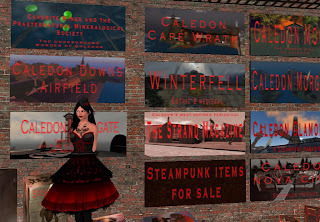 Three floors of freebies, links and landmarks for the discerning steampunk. So you won’t look like a total farb* pick up some authentic textures and artifacts such as a rusty smelter, a hobonet computer typing animation (powered by a sturdy little rat), a giant tesla ball, skybox, even a leathery catsuit and black leather kicks for the ladies. All for free! Related landmarks are gathered together here, so you may never have to step foot in the 21st century again. On the second floor you’ll find a brief history of steampunk and punkers, like the British engineer Isamard Kingdom Brunel (who smoked 40 cigars a day, slept less than 5 hours a night, and accidentally inhaled a half-sovereign coin, which lodged in his windpipe – the kind of man Siri would have invited round for tea). Online resources include links to you tube clips, Steampunk Magazine and the Steampunk Workshop. 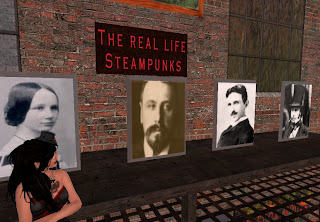 Visit the Steampunk Resource Center here. *wiki says: Farb “is a derogatory term used in the hobby of historical reenacting for participants who exhibit less commitment to historical authenticity, either from a material-cultural standpoint or in action.” (Though, believe me, steampunks are far more forgiving then the rev war folk).